On Face Off Season 8 Episode 4, the 13 remaining artists are tasked with making playing cards come alive in the whimsical style of Tim Burton. On Face Off Season 8 Episode 3, guest judge Josh Hutcherson from "The Hunger Games" helps assess the 14 artists as they take part in a deadly predator challenge. 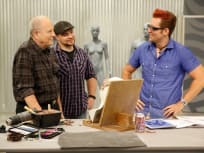 What went down on Face Off Season 8 Episode 2? You can read more about this episode of the Syfy reality series right here and right now. Go for it! On Face Off Season 8 Episode 1, three former champions come back to the competition but this time they're all coaches and the artists are introduced to their first Spotlight Challenge.